As reported in part from the May, 2012, Environmental Sustainability Report prepared by the California Rice Commission. 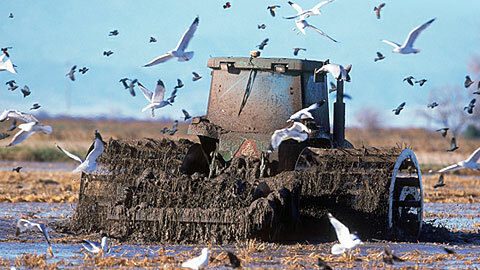 California (CA) rice is grown on soils unsuitable for other crops because of poor drainage. This land is ideal for rice production and produces the world’s highest rice crop yields. Because rice is an aquatic plant, continuous flooding is the most effective method of irrigation. Flooding effectively enhances weed control and minimizes the need for herbicides and additional fertilizers. Our industry recognizes that water is an ever-increasingly limited and expensive resource. In the last 30 years, CA rice production has achieved a 40% increase in water use efficiency. By utilizing unique irrigation processes, water quality problems associated with other crops and locales such as soil erosion and high concentrations of trace elements are typically not a problem with rice farming. The use of EPA-designated “Reduced Risk” formulations in CA rice production constitutes 25% of total pesticide applications today, representing an 87% increase since the year 2000. The movement to these “Reduced Risk” formulations is expected to continue in the coming years. In 1980, 95% of CA rice fields were burned after harvest to dispose of left over straw and to control disease and pest problems that can carry over between crops. That post harvest burning, while very effective, also produced many pollutants, impacting the air quality of the Central Valley region during burn season. The rice industry worked proactively with the State Legislature to significantly reduce rice straw burning. By 2010, less than 10% of the fields were burned and these only on an exception basis where major over-wintering disease and pest problems could be substantiated. This cooperative effort has reduced the air pollution impact from open rice field burning by 90%. Today the straw is either incorporated into flooded fields and allowed to naturally decompose or bailed and used in many different applications. Through improved equipment efficiency and changes in other rice specific production practices, the primary energy ratio for rice production has been reduced from 29% to 22% over the last 30 years. In other words, for each acre of rice produced in CA in 1980, it took 29 units of primary energy (fuel and electricity) to produce 100 units of food energy in the form of rice—a net energy gain of 71 units. In 2010, the net energy gain was 88 units. Wadham Energy operates in Williams, CA. This major biomass facility uses rice hulls as a renewable fuel to produce electricity and is rated at 26.5 megawatts, producing over 200 million kilowatt-hours per year from 200,000 tons of rice hulls. This plant uses about 50% of the rice hulls produced by the CA rice industry each year to produce an equivalent amount of electricity to that required for all rice production operations in the state. 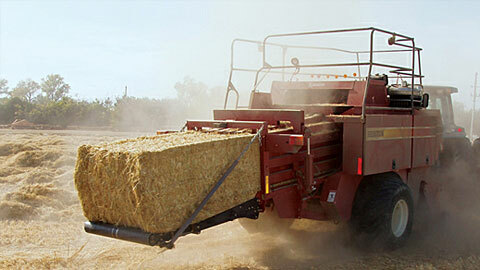 Today, there are plans and proposals to increase the use of both rice hulls and rice straw for energy production in CA. Many rice drying and milling operations in CA have installed solar energy projects to generate energy on-site. In 2010, the total installed capacity of these projects was about 10 megawatts capable of generating about 20 million kilowatt-hours of solar power annually. This is the equivalent of about 25% of the electricity used for drying and milling CA rice. This is a trend that will likely continue over the next decade. Throughout the various stages of rice production greenhouse gasses are generated. However, studies show that even taking into account the increase in methane emissions that occurs when rice straw is incorporated into the flooded fields rather than burned, there has been no net increase in greenhouse gas impact per unit of rice production in CA from 1980 to 2010. Equally notable, the amount of total greenhouse gas emissions from rice cultivation in CA is only one-tenth of one percent (0.1%) of statewide greenhouse gas emissions. Traditional wetlands have decreased over the years in California due to agricultural and urban development. Historically in the Central Valley, four million acres were available as wetlands habitat for various species of waterfowl and shorebirds. 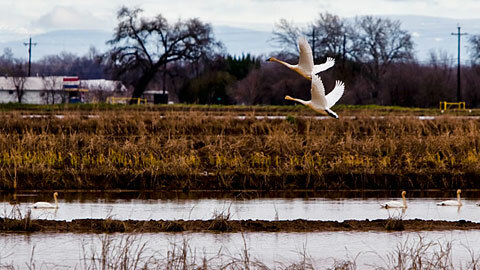 Today, only 205,000 acres of Central Valley wetlands remain. As air quality concerns have moved rice growing practices to winter flooding for straw incorporation and decomposition, new fall and winter wetlands habitat has been created for native species. 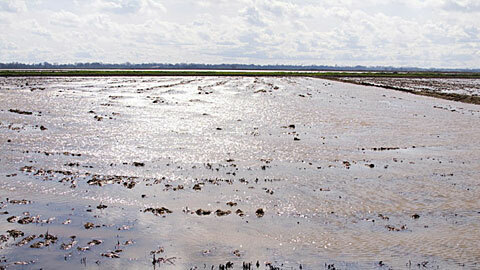 Flooded rice fields serve as surrogate wetlands, providing similar habitat benefits and supplying about two-thirds of the food value provided by managed wetlands. CA rice production provides approximately 500,000 acres of habitat annually. This habitat provides nearly 60% of the food resources consumed by wintering waterfowl in the Central Valley and is the sustenance for 2.5 million of the 5 million ducks using the Pacific Flyway. And, it is the habitat for 14 species of raptors (hawks, eagles and owls). If winter-flooded rice acres were lost, to replace this habitat and to support the same populations of wintering waterfowl, an initial capital outlay of $1.5 billion would be required, plus $30 million per year in wetlands maintenance costs. 40,000 acres of existing natural wetlands rely upon rice drain water. The increased cost to deliver water to these critical wetlands, if available, could be as much as $5 million per year. Rice fields in the Sacramento Valley are specially-designated as Shorebird Habitat of International Significance—one of the largest special ecological sites in North America—supporting upwards of seven million waterfowl, 300,000 shorebirds, and nearly 230 species of wildlife overall. For more information on sustainability as it relates to California rice, contact the California Rice Commission or download their The Environmental Sustainability Report, dated May, 2012.